The Center for Climate, Health, and the Global Environment (C-CHANGE) was officially launched last month at the Harvard T.H. Chan School of Public Health. At the opening event, the Center's Director Gina McCarthy said “C-CHANGE will ensure that cutting-edge science produced by Harvard Chan School is actionable—that the public understands it, and that it gets into the hands of decision-makers so that science drives decisions.” Such science includes research on healthier buildings. ArchDaily reported that C-CHANGE's Healthy Buildings team have released a list that "details the simple foundations of making a building healthy." 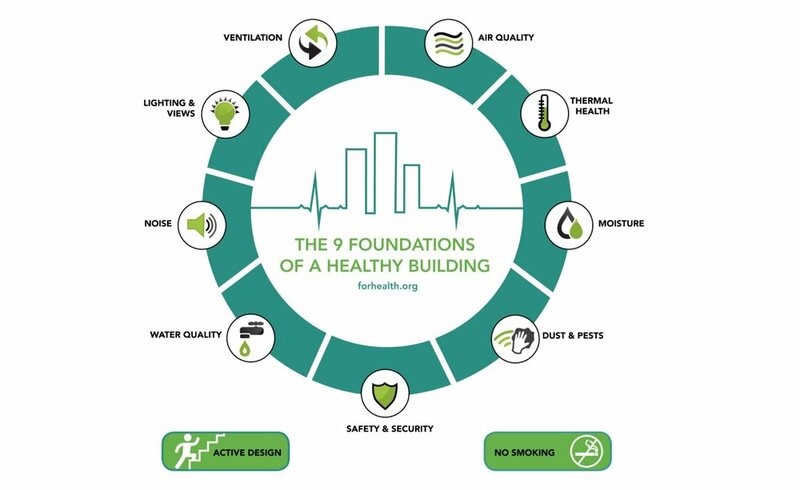 The 9 foundations for healthy buildings include ventilation, air quality, thermal health, moisture, dust/pests, safety/security, water quality, noise and lighting/views. The team created these foundations as a standardized, holistic approach to understanding how buildings impact the people inside them. In their report, the team explains that these nine factors can be assessed using performance metrics to show how a building’s health functions can be improved or optimized. Such assessments are among our expertise. The Center's full 36-page report is available here. April 22 is Earth Day, the annual effort to demonstrate support for environmental protection. The date was originally chosen (47 years ago) in order to maximize participation on college campuses for what the organizer conceived as an "environmental teach-in" for students. Today the event is global, and various sectors use the occasion to mark their commitment to a healthy planet - including architects! Sustainability is about positioning current and future generations for prosperity by reducing buildings’ impact on the environment, restoring our natural resources and creating safe and vibrant communities. When architecture is sustainable, it performs to its highest design potential: producing not consuming; providing resilient structures and communities that withstand the onslaughts of both natural and man-made disasters; and fostering opportunities for health and well-being. Sustainability is a key element of the architecture profession’s approach to design in the 21st century as it tackles the compounding global challenges of resource availability, water quality and increasing pollution. It is part of an architect’s approach to protecting the health, safety and welfare of the public. Community sustainability goals are fulfilled in large part by an architect’s ability to create practical solutions to the challenges posed by climate change, population growth and the pursuit of more connected, healthier communities. To read more about the AIA's commitment to sustainability, click here. Of course, I'm happy to chat about the topic with you at any time.